Our class instructional program is known for the high quality and enthusiasm of its instructors who help athletes reach their personal best. Athletes and parents are welcome to observe any of our classes prior to signing up. 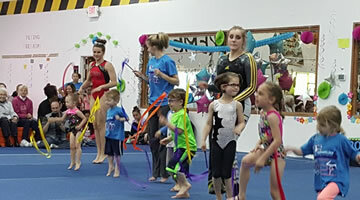 Gymnastics Zone offers a wide variety of training classes for athletes of all ages! From Tiny Tots to our Gymnastics Extreme Team our instructors cater for every level of gymnastics students. 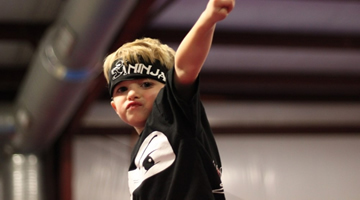 A fusion of obstacle training, gymnastics, martial arts and freestyle movement. Looking for an for a fun and exciting venue for your childs next birthday? Gym Zone parties are fliptastic! We organize the activities, fun and games in a safe environment. Book your private party today! Cheer Zone and the Gym have teamed up to introduce a new cheerleading program. Whatever your team is training for, our staff will help your team reach its potential. 1 on 1 private lessons are often the fastest, most effective way to improve your skills. We offer custom Cheer & Dance Music for all types of cheerleading & dance teams. Cheer Zone Extreme offers the most innovative and top notch cheerleading camps in the Area! We specialize in custom choreography for all cheerleading teams of any age and skill level.